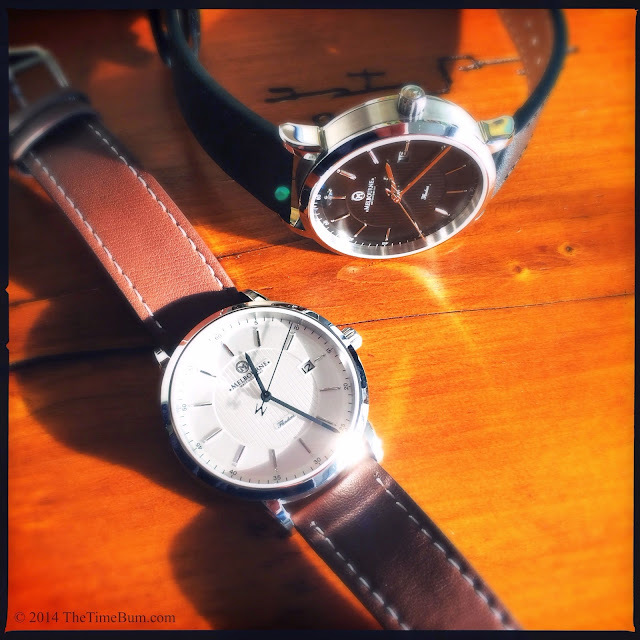 Not long ago, I introduced my loyal Time Bum readers to Suj Krishnan's Melbourne Watch Company and his debut model, the Flinders. From the specs and prototype photos, I thought the watch looked quite promising, and legions of crowd funding backers agreed. 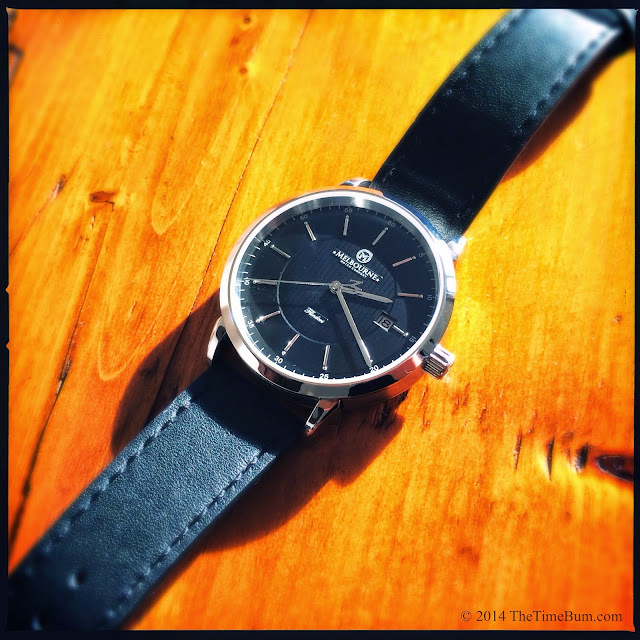 Once the watch made production, Suj sent a pair stateside and I was lucky enough to get them for a hands-on review. Does the real live, ready-for-prime-time Flinders live up to its pre-production hype? I am pleased to report that it does. 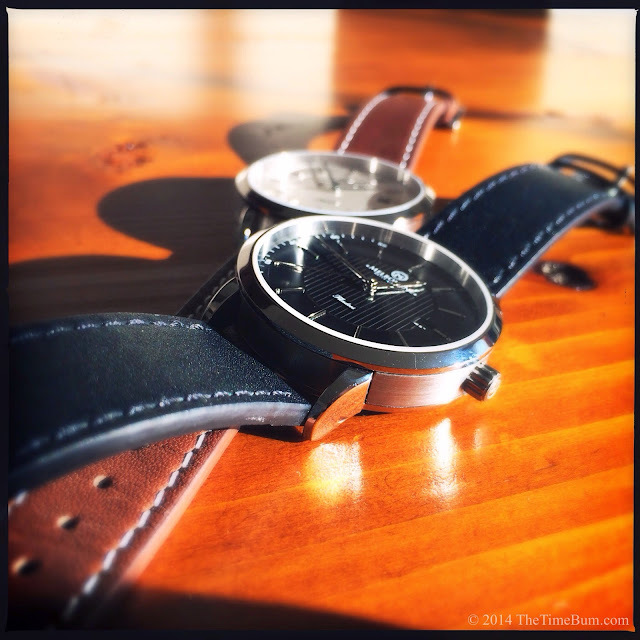 The Flinders was designed as a dress watch that could also see service on the weekends. Suj has accomplished this with a clever balance of design elements, starting with the round, stainless steel case. It is 40mm wide and 10.5mm thick, landing neatly between tool watch wrist presence and dress watch discretion. As I mentioned in the preview, the case displays three distinct sections in profile: a brushed barrel, polished beveled bezel and bottom plate. 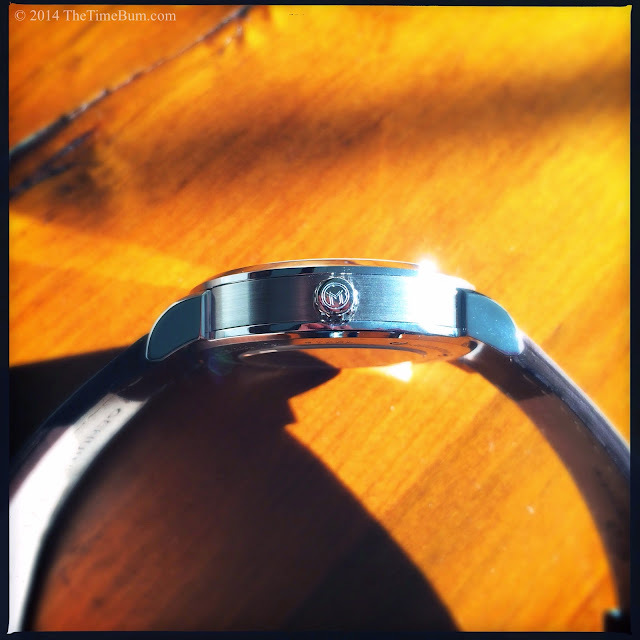 With the watch in hand, I could see the lugs and bottom section are one piece, all polished. The variety of finishes looks fantastic, and also makes the watch appear slimmer. It has flat sapphire crystals front and rear, and is rated for 50m water resistance, which is in keeping with its intended dress to dress-casual nature. It is not tool watch tough, but more than sufficient to handle a night on the town. The movement is a Miyota 9015, a high beat (28.8k) hacking and hand winding automatic that is becoming increasingly popular as an ETA 2892 alternative. A chunky, push-pull crown sits at 3 o'clock. It is decorated with the Melbourne "M" and looks great, but despite its size and texture, I found it difficult to grip. There is no overhang, which means you must pull the crown by its sides, without a way to lift beneath it. This arrangement might have worked better with a diamond or onion shaped crown (although neither would have looked right on this watch), but it is hard to operate with a cylindrical crown. It was not an insurmountable problem. After a bit of practice, I found the angle of attack that worked for my fingertips, but a cut out just below the crown would have helped considerably. The large dial looked richly detailed in the pre-production photographs, and those pictures did not lie. It is just damn lovely. The markers are slim, polished, and applied. 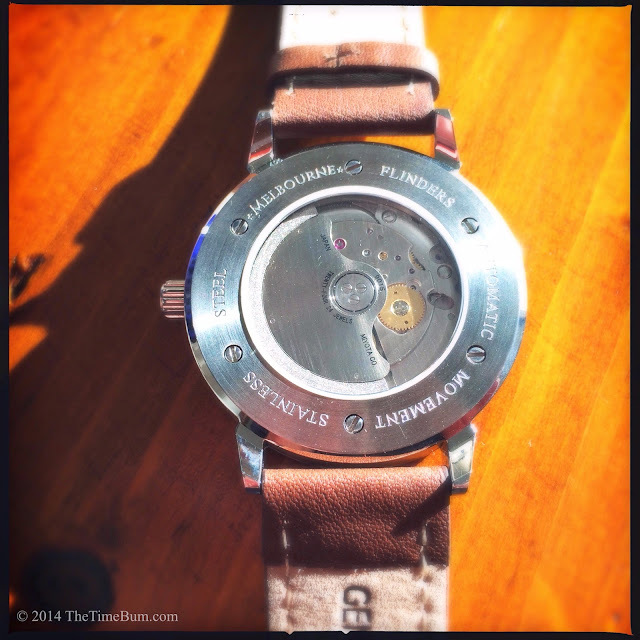 The recessed center section of the dial has a vertical texture. A modest, printed index rings the dial. The date window is at 3 o'clock. Text is limited to Melbourne logo and brand at the top of the dial, and "Automatic" script below. The sweep hand is decorated with an "M" on the tail. It is a particularly pleasing design, brimming with eye catching detail. The effect is subtle on the black dial and more pronounced on the white, which incidentally, is actually a pale silver, adding yet another interesting dimension to the face. The hands are polished on the black dial, and black on the white dial. I found this decision curious. The black on white contrast does make the white watch easy to read, but I would have preferred polished hands to better coordinate with the markers as they do on the black version. In keeping with its dress watch inclinations, there is no illumination. The supplied leather strap is 20mm wide, with a polished and engraved buckle. 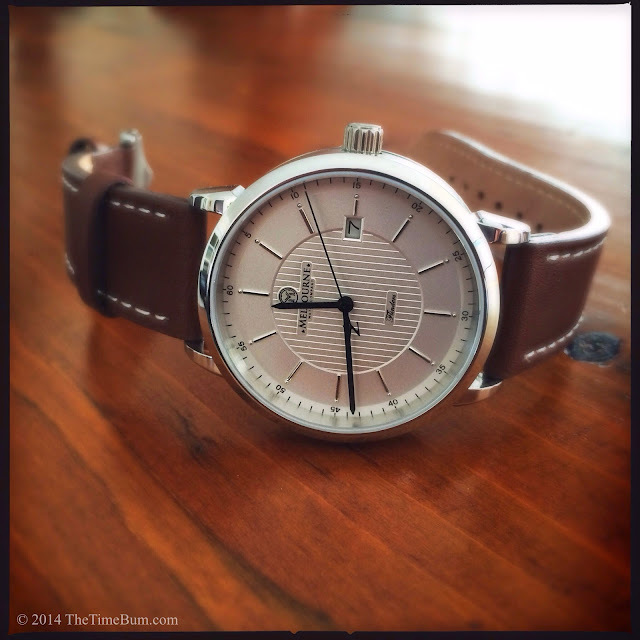 The while dial comes on a brown strap with contrasting white stitching. The black dial watch has black leather with matching stitching. 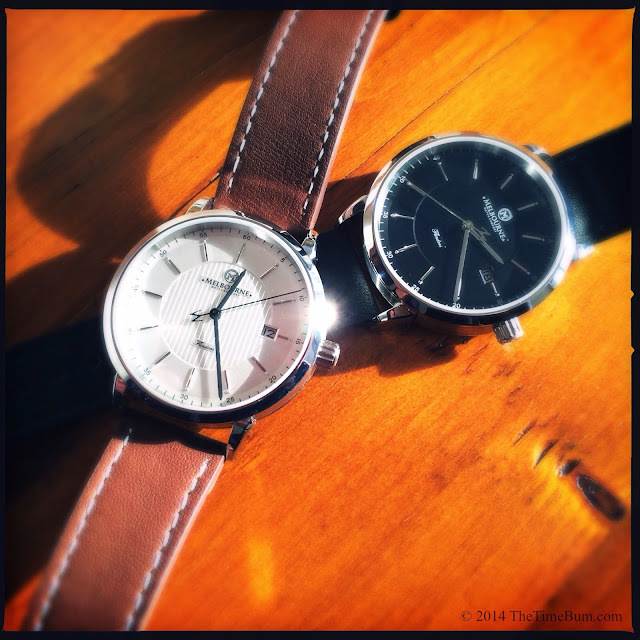 As with other elements on the watch, the straps straddle the line between dress and casual, but in this case they lean more to the casual side. If I were wearing the watch with a suit, I might be inclined to try a padded and tapered crocodile or gator print. Of course, I could also swap a brightly colored regimental stripe NATO and wear it with a blazer and khakis. Such is the chameleon like nature of the Flinders. Versatility is part of the package. Forward thinking Indigogo backers could have snagged a Flinders for under $320 US, which would have been a steal. If you were not among them, fear not. You can still purchase one for about $490 US at current exchange rates, which is right in line for a watch of these specifications. 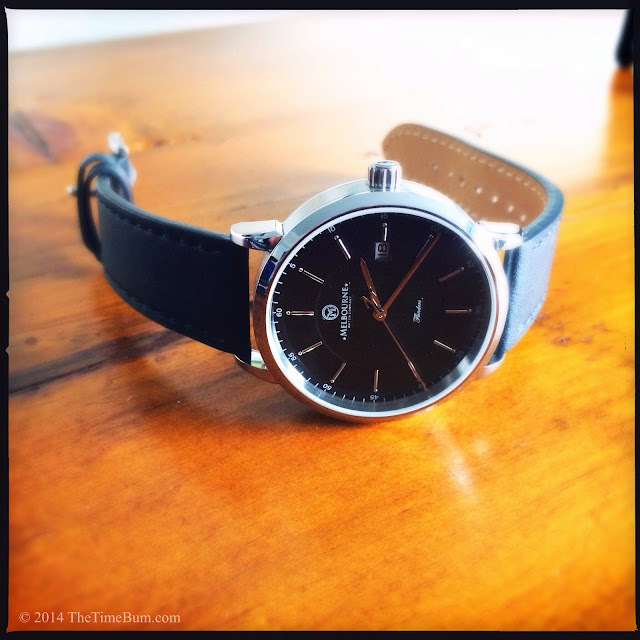 This is a quality watch with an exceptionally balanced and elegant design. In his independent watch debut, Suj has produced an absolute winner. Pro: A versatile watch and a visual treat. Sum: An impressive watch from a talented newcomer. The Time Bum approves, and can't wait to see what Melbourne will bring us next.